My three-year-old daughter knows how to spell S-T-A-R just in time for Christmas! Want to know why? WordWorld, the popular children's PBS preschool show, is airing a new holiday episode this December. We were offered a chance to watch the advance holiday screener and my daughter loved it! The episode will air several times beginning tomorrow, Dec. 1st. Make sure to check your local television listings to find out when it is on in your area! "The Christmas Star" - Duck tries to catch a star for the top of Frog's Christmas tree but fails and falls asleep crying. His friends come to the rescue and give him a special present, the letters for the word S-T-A-R.
"A Christmas Present for Dog" - All the WordFriends send letters to Santa. Pig wants a S-L-E-D, Ant asks for a C-O-O-K-I-E, Bear wants a D-O-L-L and Dog really needs a B-A-L-L. Christmas arrives and all get their presents except poor Dog. The WordFriends learn that one of the best parts of Christmas is not receiving but giving. The Christmas episode, like the other WordWorld episodes, promotes early literacy for preschool children. 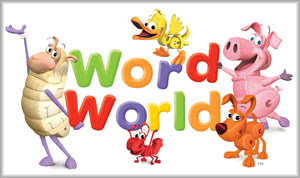 The show's goal is to improve word recognition and early reading skills. Letters in certain words "come alive" and creatively morph into respective characters or objects. 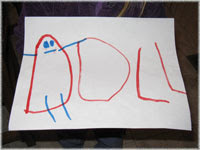 After watching the Christmas episode, my daughter attempted to write her own letter to Santa, asking him for a D-O-L-L. And amazingly, she could spell it, just like Bear! For my Christian readers I want to point out that the show, not surprisingly, has a secular viewpoint. As a Christian, we are taught that the Christ's birth is what Christmas is all about, not necessarily just giving. Also, the star on a Christmas tree is special because it symbolizes the Star of Bethlehem, not the simplified version as Frog describes it saying, "It's special because every year at Christmas time the brightest, most beautiful star of the season appears in the winter sky." WordWorld has won many awards including an Emmy and a Parents' Choice Gold Award. In addition, the interactive WordWorld Website is definitely worth a glance. My daughter especially enjoys playing Dog's Letter Pit and Alphabet Falls. Still looking for a great holiday gift for your preschooler? WordWorld educational toys are available for purchase from Target. We had the opportunity to try out the Mega Bloks WordWorld Bucket Set - Barn. The playset has been a really big hit with my daughter. The 49 piece set includes two WordFriends you can assemble (Cow and Pig), the tractor and cart, hay, a fence, windmill, and a shovel that all fit nicely into the BARN container. 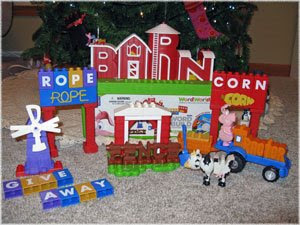 In addition, kids are able to use the 16 double-sided letter blocks to spell different words like CORN and ROPE. Best of all, the set can be used with other Mega Blok and Duplo sets for hours of play. My only complaint is that I wish more letter blocks were included so you could display the entire alphabet from A to Z. Luckily there are enough letters to spell out both my daughter's name and son's name, separately. I am unable to spell my own name with the letters that are included though. As a bonus, the set comes with a DVD that includes one WordWorld Episode. If you haven't watched WordWorld yet on PBS with your kids or looked at the WordWorld website, you should check it out this December! Always wanted to ring that bell but for some reason never got around to it? Here's your chance. You can start your own personal online virtual Red Kettle and collect donations from your friends, family and and all your online visitors. Visit www.onlineredkettle.com for the details. Did you watch the Macy's Thanksgiving Day Parade? Every year we try to watch it as a family, but this is the first year our daughter seemed interested. She really loved all the character balloons especially Horton the Elephant, Snoopy, Dora the Explorer and Buzz Lightyear. We were more prepared for the parade this year thanks to The Itty-Bitty Bookworm. Our sample of the Bo Curriculum, Year 2 for the month of November included a lesson using the book, I Know an Old Lady Who Swallowed a Pie by Allison Jackson. The book has a surprising Thanksgiving Day parade balloon ending. We probably wouldn't have stumbled upon this unique picture book if we hadn't tried the wonderful curriculum offered by The Itty-Bitty Bookworm. Do you love sharing picture books with your children? Do you desire to take this reading to a new level? Then you really should try the Itty-Bitty Bookworm curriculum CDs. • The Itty-Bitty Bookworm is an affordable, literature-based preschool curriculum. • Developed by early childhood educators, the program is child-friendly, organized and easy to use. • It is a program designed for children ages 18 months - 5 years of age. • The curriculum is an excellent resource for parents, family child-care centers, child development centers, home-schooling families and librarians / library storytimes. Above is a picture of my daughter reading one of the recommended November books and referring to the special booklet she made from one of the printable activities found on the CD. The curriculum guide we received for November came as a PDF file totaling 191 pages!! The CD is jam-packed with crafts, individual or group activities, games, alphabet lessons, rhymes and finger plays, flannel board ideas, printables and so much more. As a former children's librarian, I highly recommend the Itty-Bitty Bookworm programs. The Itty-Bitty Bookworm also offers Bible Story Units useful for supplementing Sunday School lessons, Moms Morning Out programs, and Christian preschool programs. Be sure to also check out the Free Resources Page and Raising Itty-Bitty Bookworms Blog for more useful information. Itty-Bitty Bookworms is having an awesome Black Friday Sale. From now until Sunday, November 30th, 2008 they are offering a year of Curriculum on CD for only $150. (Purchase any 6 CDs and get 6 for free.) To take advantage of this offer, simply purchase any 6 CDs. Then in the comments section at checkout, let them know which 6 CDs you would like for free. You can mix and match between Year 1 and 2 and between Bo and Bailey's Curriculum. Email Tara at Itty-Bitty Bookworms if you have questions. Win the curriculum! The Itty-Bitty Bookworm has kindly offered to give one of my readers the Year 1 curriculum on CD. The winner can choose between the Bo or the Bailey Curriculum. To enter, visit The Itty-Bitty Bookworm and leave a comment here telling me what you like best about the curriculum. • Contest ends on Monday, December 15, 2008 at 11:59 PM CST. • Winner will be chosen at random and contacted by email. You won't find comical turkeys or pilgrims in the Give Thanks to the Lord picture book. What you will find in this Christian themed Thanksgiving story is a little boy sharing a wonderful Thanksgiving meal and day with his family. Rhyming verses talk of hugs and kisses, leaves, prayers, yummy pies, and food, family and fun - all the warm fuzzy feelings that go along with Thanksgiving. The detailed watercolor illustrations by Amy Bates enhance the sweet story. This is a superb book to share with your children. It is good to give thanks to the Lord! Happy Thanksgiving! Watch Laurie tonight as she airs her third webcast (Wednesday, November 26th) at 8PM EST. Visit the official Two Tomatoes Website to watch. She will be reading fan mail and singing some Turkey Day tunes. You can watch her archived webcasts there as well. 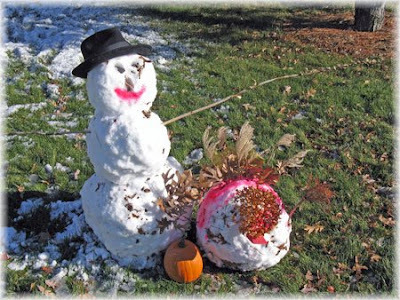 It snowed here Monday morning...perfect snowman building snow. And snow turkeys, too! This morning my daughter says, "Mom, look at the big birds outside our window." 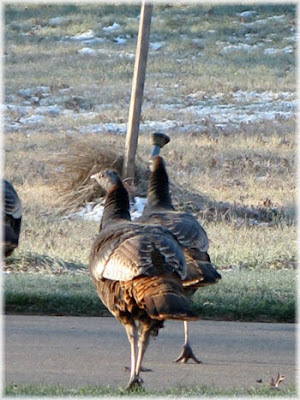 Sure enough, the turkeys outside our window must not realize what tomorrow is! Guess they know they are safe in the city. Yes, I really did just take this picture. Happy Thanksgiving! "Oh give thanks unto the Lord, for he is good and his mercy endures forever." Avast, Ye Pirate Fans! VeggieTales' second theatrical release is now available on DVD. In The Pirates Who Don't Do Anything , Larry the Cucumber, Mr. Lunt, and Pa Grape star as pretend pirates named Elliot, Sedgewick, and George. Working as busboys in a dinner theatre, they really are the most good-for-nothing, aimless pretend pirates that ever existed. That is until one day a they stumble upon a "Helpseeker" and find themselves sent back in time to help a princess rescue her brother from their evil pirate uncle. Along the way they fight evil cheese curls and giant rock monsters. They conquer the seas and face their own fears along the way to become heroes of the day. Unlike some other VeggieTales productions, this movie is not based on any biblical text, but the movie does very, very subtly teach Christian values along the way. Phil Vischer, one of the movie's creators, summaries the Christian aspect of the movie best in his interview with Religion Writer, "Regardless of how you view yourself, God has created you to do something really cool. That’s why we’re here, and it involves helping others, and it has nothing to do with how big and brave and strong you are, and everything to do with trust in God to give you what you need." I must say I am a bit embarrassed to admit this is my first foray into the VeggieTales world so I cannot say how it compares to their other productions. The graphics of the film are well done and the movie is interesting enough to keep viewers intrigued. It bothered me a bit that the vegetables don't have arms but yet by some miracle are still able to wield swords and row boats. Guess that must be a Veggie thing. The evil cheese curls were scary to my preschool age daughter (a subliminal message that junk food is bad for you?) and a few other scenes are slightly violent, so the film is probably best for ages 5 and up. The music in the film was one of my favorite parts, from "Jolly Joe's" rootbeer crazy square dance song to the pop-rock cross big band "Yo Ho Hero." Well, Me Hearties, if you're looking for fun, lighthearted, creative movie fare, the VeggieTales movie is certainly worth a gander. It truly is "a swashbuckling good time for the whole family!" Thanks to ConnectingMoms.com for the opportunity to review this DVD. A new, never before published, Margaret Wise Brown book has entered the children's book world titled, The Moon Shines Down. How can this be, you ask? Well, although Margaret Wise Brown died in 1952, several of her unpublished manuscripts have survived, left undisturbed with rusting paperclips in a cedar trunk for decades. The book, The Moon Shines Down is one of those rescued treasures, completed by Laura Minchew and lovingly illustrated by Linda Bleck. 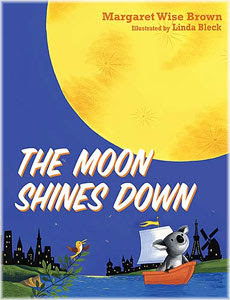 The Moon Shines Down is a picture storybook blessing for the children of the world. 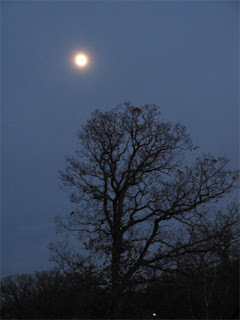 The familiar nursery rhyme and prayer, "I see the moon, and the moon sees me; God bless the moon, and God bless me" forms the basis of book's rhyming text. Rich, vibrant illustrations on glossy paper showcase a little grey koala bear as he travels the world and observes all the animals and people slumbering under the same bright yellow moon. In fact, if you look closely, you can find the koala bear on every page spread (sometimes a bit hidden) just like the little mouse in the color illustrations of Goodnight Moon . The book includes the following geographical locations: the Netherlands, Switzerland, the Far East, Mexico, France, Australia, England, Africa, and an unspecified ocean. My daughter and I have had fun trying to find the locations on our world globe. The book undoubtedly would make a wonderful Christmas present. Christmas night is featured on four pages toward the end of the book, with verses reading, "The Moon shines bright on Christmas night..." and "the Moon sees the Christ Child, Heaven's Baby." I want to mention that the book was written from an unfinished, unpublished manuscript by Margaret Wise Brown that was too short for publication. 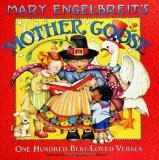 Laura Minchew took on the task to complete the book, so her verses are intermingled with those of Margaret Wise Brown. Additionally, one verse describes Africa as a country, not a continent. I wish the book included a map of the world and an earth/moon picture to encourage some beginning geography and astronomy lessons. That being said, I myself am delighted to have this book by Margaret Wise Brown to read to my children and add to our library, especially with Christmas coming up soon. Win a Copy! Thomas Nelson Publishers has kindly sent me three (3) hardcover copies of The Moon Shines Down to give away to my readers. To enter, visit Thomas Nelson - Books for Kids and leave a comment here telling me which book interests you the most besides The Moon Shines Down. • Contest ends on Monday, December 8, 2008 at 11:59 PM CST. Just a couple of tibits for you! 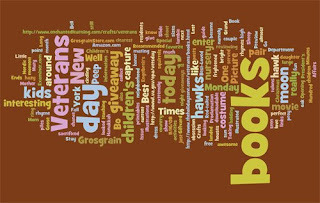 Today's Full to the Brim - Kids Book Giveaway List will be posted tomorrow, Tues. Nov.25th. Due to the Thanksgiving weekend, there will not be a Friday Full to the Brim post this week. If you haven't taken the time to look at the Barefoot Books website, now is the perfect time. 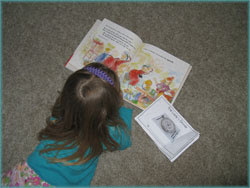 Barefoot Books is running a free shipping promotion on all orders until Tuesday, November 25, 2008. Barefoot Books is an independent publisher and features "award winning books, gifts and art for the child in all of us!" Check out the site today - you'll be impressed by the diverse, multicultural range of books and products available. I have joined the Barefoot Books affiliate program; if you blog, you can, too. Email me - Ask me how! I donate all commissions earned from my Barefoot Books sales our local public library. If you are interested in learning more about some quality Lands’ End products this post is for you. Lands’ End sent me three items to review this holiday season. And, if you read closely, one of them can be yours, too. 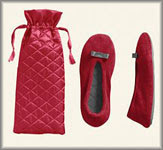 These cozy padded terry cloth ballet style slippers conveniently arrive in their own traveling bag. The non-slip sole features rubber treading. They ran a little small for me so you might want to consider ordering a size larger, especially if you plan to wear them with thicker socks. 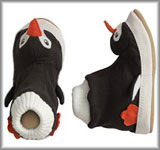 My preschool age daughter immediately fell in love with her cute penguin character slippers. They pull on easily just like socks (she can put them on herself) and have an extra thick padded footbed. In fact, she has proclaimed that she is going to wear them all the time, even to bed! The Lands' End website provides a handy kids footwear sizing chart you can print out for accurate foot measurements. Other styles include bear, dog, ice skates, snowflakes, scotties, and ski badges. Traveling? 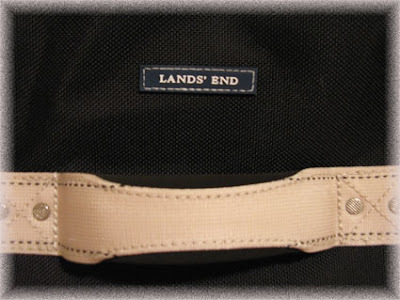 You need to check out Lands’ End luggage. Here's one of the newest additions to the durable line. Wow, this is one posh duffel bag! Actually, the name "duffel bag" sounds beneath this impressive piece of luggage. 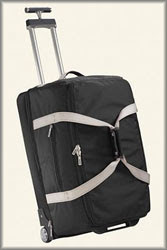 The luggage features a telescoping, swiveling handle that makes wheeling the bag a breeze. The bag is constructed out of the familiar durable nylon like most Lands' End luggage. I love, love, love that you can unzip the bottom compartment and store your shoes separately from the rest of your clothes. A couple of other zippered areas are well placed, one on the outside and one inside. And, the walls of the bag collapse to make storing a little easier (it might even fit under your bed.) Comes in your choice of three sizes. This holiday season please consider buying some gifts from Lands' End. In doing so, not only will you be purchasing quality products, you will be helping to support a great community in southwest Wisconsin. Please check out www.landsend.com … lots of great deals in the Overstocks section right now, too. Lands' End has kindly offered to give away your choice of one of the three items I have featured above, either the Women's Regular Terry Travel Slippers with Bag, Kids' Fleece Slippers or Lighthouse Wheeled Duffel Bags. To enter, visit www.landsend.com and leave a comment here telling me which of the three items you would like to win (include your color preference). Let’s Get Ready For Kindergarten and Let’s Get Ready For First Grade book set by Stacey Kannenberg. Life In a Shoe - Book Giveaway Ends ?? I'm posting a huge review and giveaway on Saturday. Curious? Any guesses? Check back Saturday morning. If you haven't been over to Cool Baby Kid before, you really should visit. It's a great product review blog written by Dr. Cecelia Mecca, an experienced educator. The Cool Baby Kid site has now been revamped and is celebrating a launch party today boasting two new cute, little baby blog additions (Smart Baby Kid and Ask Baby Kid). Make sure to stop by each of the three blogs for a look. You'll find a special "Baby Launch Prize Pack" giveaway at each one! Contests end 12/2/08. Smart Baby Kid focuses specifically on educational toys, games, websites, books, DVD's and more. Ask Baby Kid allows readers to ask questions about parenting and blogging and receive quick answers they actually have time to read. Once in a blue moon, a book comes along that you know will remain in your memory for some time, possibly forever. In a Blue Room , by Jim Averbeck and illustrated by Tricia Tusa is one of those books. First, I must mention to you that my own bedroom as a child was painted a light powder blue color and the floor was covered in thick blue shag carpet. Blue is a comfortable, familiar color. Naturally I was drawn to the picture book just from reading the title. But, titles can be deceiving. Alice, the little girl in the story, desperately wants to sleep in a blue room; only, well, her room is anything but blue. Alice’s mother slowly settles her blue-seeking child by giving her comforting items that bring calm to all five of her senses. However, none of those items are blue either. Very tired, “Alice yawns, almost gone.” Finally her wish comes true as she falls to sleep in a gorgeous, magical world. To tell you more would spoil the fun. This lovely bedtime story by Jim Averbeck is as comforting as a favorite lullaby, a perfect read-aloud. Sweet, enchanting verses couple with quaint illustrations of a doll-like little girl in a cozy, dreamy bedroom. Tricia Tusa really does work magic with her watercolors. And, the ending is simply delightful. Now excuse me while I gather some flowers, sip a cup of tea, snuggle into my favorite quilt, listen to some lullaby bells and fall into a gentle slumber in my own blue room. Sweet dreams! Looking to add to your kid's music collection? The Fids and Kamily Music Awards were announced today and they've got a whole list of albums you must check out! Who holds Fids and Kamily Music Awards you ask? Basically, it's a group of knowledgeable people involved in the kid's music industry that get together and pick their favorites. And, in my humble opinion, they do a pretty decent job. The top pick this year? 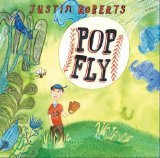 That honor goes to Justin Roberts for his album Pop Fly . Want the lowdown? Visit the Fids and Kamily blog for the list in its entirety. A Busy Mom's Christmas Organizer, keeping it all together this holiday season! The Magician’s Book: A Skeptic’s Adventures in Narnia by Laura Miller. Looking for a unique Christmas gift for mothers, dads, grandparents and others? Why not give them a handmade gift? And now is the perfect time to start making those handmade items. The kids and I enjoy the crafting. Here are a couple of ideas to help get you started. One of our favorite projects is Salt Dough gifts. You can make impressions or ornaments. 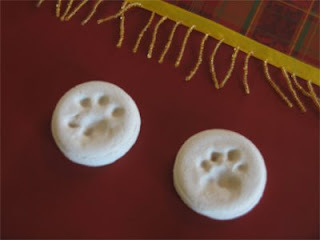 This year we are working on making paw print ornaments of our cat's paws to hang on the tree. Just mix up any old salt dough recipe, grab your pet, press their paw into the dough, let dry and paint. Our ornaments below aren't quite finished; they still need to be painted and we need to add a ribbon to hang them with. What a great way to capture and create pet memories! Why buy wrapping paper when you can personalize your own? Even the littlest ones can participate. 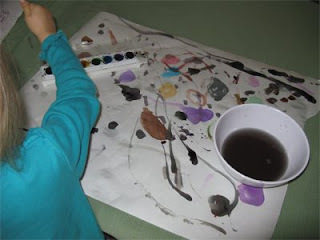 Supplies needed: One large roll of plastic coated Freezer Paper, some washable watercolor paints, a bowl of water and some imagination. Paint to your heart's content, let dry and wrap your gift with love! SHHHH...don't tell. Daddy moved into a new office this year and the walls are bare. We are planning to make him a painting masterpiece to hang in his office. www.craftplayground.com has directions for a stretched canvas painted artwork kids can make. We haven't bought the supplies yet, but when we get it finished we'll be sure to post a picture. Basically all you need is a pre-stretched, pre-primed canvas, washable paints, brushes, sponges, and some clear acrylic matte finish spray. 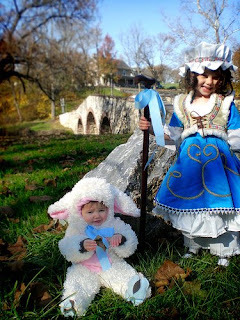 Fairies: Petal People You Make Yourself (Ages 8 and up)- Got a child obsessed with fairies? Make your own Fairy dolls with this book! Create Anything With Clay (Ages 5 and up) - Have fun making and baking clay creations. Comes with eight pieces of clay. This post is an entry into the Handmade for the Holidays: Be a Klutz and Win! Contest. Are you a blogger? Blog for your chance to win a library of 15 Klutz books ($230 value), a $100 gift certificate to klutz.com or a $50 gift certificate to klutz.com. Visit The Parent Bloggers Network to find out more. The printed word was never so much fun. Make your own "Word Cloud" at Wordle.net. Wordle your blog, your christmas letter, your essay, use it in your classroom...whatever. Wordle was created by Jonathan Feinberg. Join me in telling him this is the coolest thing you've seen in quite awhile. Taking the day off today. The kids are still under the weather. Here are a few interesting current links on children's books. A hawk and the moon. Well, our neighborhood has a few interesting residents, namely a mating pair of hawks. 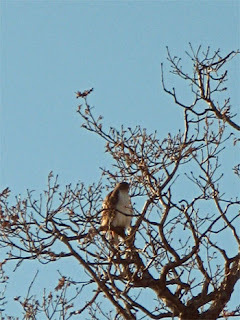 I think they are Red-tailed Hawks. On Monday they were circling high above the houses looking for prey. One landed in a large oak. I tried my best to get a picture, but the point and shoot zoom isn't the clearest. After watching the new Tinker Bell movie, my daughter is extremely frightened of the hawks. In the movie a hawk tries to capture Tink with its talons. We've seen them capture squirrels around here. Preview more of this week's Wordless Wednesday posts at 5 Minutes for Mom. 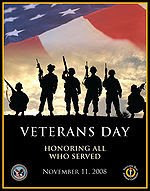 Today we thank and honor all those who have served our country. You have sacrificed much so that we can be free. Ah, fall. The lovely leaves, cool, brisk days and bring on the colds! Yup, the kids are sick. But, fear not. We've got a book to help uplift the spirits. 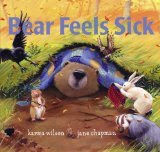 Our family loves the Bear books by Karma Wilson and illustrated by Jane Chapman. And, low and behold, there's one especially for those sick days. Bear Feels Sick is a sweet, comforting story for the kiddos when they're stuck in bed with the ills. Autumn arrives and bear feels unwell. He's stuck in his cave and doesn't feel at all like playing with his friends. But, lucky him, his friends are kind and take care of him. He finally sleeps it off and starts feeling better. Looks like a puppy is headed for the White House! President-elect Barack Obama apparently made a pledge to his daughters Malia and Sasha. His promise -- after the election, they would get a puppy. So, of course, there's a lot of press coverage devoted to this potential presidential pet. What breed are they going to choose? Will the puppy come from a shelter? I imagine the answer will soon come. In the meantime, here's a fun book all about past presidential pets. I received a copy of Wackiest White House Pets by Gibbs Davis just in time for the elections earlier this week. The children's book covers an amuzing array of past presidential pets, from Jefferson's mocking birds to Teddy Roosevelt's chaotic "zoo" which included a one-legged rooster! Fifteen presidents and their pets are featured in this lighthearted read, each earning a special wackiest pet designation. For instance, George Washington's horses earned the "Cleanest Teeth" title while the "Luckiest Pet" went to Lincoln's lucky turkey pardoned from the Thanksgiving table. Hilarious almost cartoonish illustrations by David A. Johnson add interest to the text. Unfortunately, my preschool daughter was slightly frightened by the sight of John Quincy Adams running away from an alligator on the cover. However, the book is meant for ages 7 to 10, so I imagine that age group would greatly enjoy the silly scenes pictured. The final pages of the book include a fact-filled listing of all 43 presidents and their respective pets. Most kids love pets. They'll devour this read, and quite possibly absorb some useful presidential facts while they are at it! Awards: 2004 Parents' Choice Gold Award Winner. The NPR online story includes a slideshow Photo Gallery of Presidential Dogs Throughout History. My favorite photo is President Ford's dog Liberty in the Oval Office. His golden retriever looks like it's in doggy heaven! Little Green Books set: Little Panda, Little Monkey, I Can Save the Earth! : One Little Monster Learns to Reduce, Reuse, and Recycle and The Polar Bears' Home: A Story About Global Warming. We Believe in Christmas by Karen Kingsbury. Put on your tutu and dancing shoes and boogie down. Milkshake, the kids pop-rock band from Baltimore, has announced a dance video contest on the kids website Milkrocks.com. 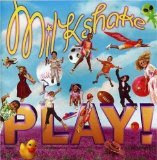 To enter the contest, Milkshake fans need to make a video of themselves dancing to the Milkshake song, "Milkshake Rock 'N Roll." A download of the song and directions for the contest are available on the Milkrocks.com website on the "Win Stuff" page. What's up for grabs? - Lots of fun Milkshake prizes, so get moving! Milkshake has appeared on PBS, Discovery Kids, and Noggin. Previously performing as indie-rock band Love Riot, the tutu wearing lead singer Lisa Mathews and acoustic guitar player Mikel Gehl reformulated their band in 2000 to cater to the kid crowd after entering the into the parent stage of their lives. The band has won several awards for its albums. Milkshake recently released their first DVD titled Screen Play earlier last month. My daughter especially loves their CD, PLAY! If I ask her what she wants to dance to, envitably she'll say, "some Rock and Roll," which is code for Milkshake. Then she whips out her tutu and her pretend electric guitar and hops and dances around! What are her favorite songs you ask? Her answer: "We Got a Band" and "Imagination Nation." It's hard to sit still listening to this energetic CD full of catchy tunes even adults can love.